Altitude: 300-500 metres above sea level. Habitat: It grows in a very dry area on rocky outcrop on coastal terraces, cliffs and slopes. Description: Eriosyce subgibbosa f. rapifera|SN|13748]], much better known under its old name, Neoporteria rapifera is one of the morphological or local form of the very variable Eriosyce subgibbosa. It distinguishes mostly in having dark purple body with black spines emphasizing the white woolly crown from which numerous magenta blooms come forth. It is very similar to Eriosyce subgibbosa var. wagenknechtii f. napina (F.Ritter) and not readily distinguishable from it, if not for the label. The” rapifera” has a swollen carrot like root often much larger than the stem, while standard Eriosyce subgibbosa var. wagenknechtii tends to have more branched roots, however most authors consider both them the same species as this differences are often determinate by growing conditions, and the number of root-branches varies greatly from plant to plant even within the same population. Roots: Swollen often much larger than the stem. Stem: Globular to columnar, up to 30 cm tall (or more), up to 11 cm wide. Grey-green. Ribs: 11-17 very obtuse, more or less notched with chinlike protrusions. Areoles: Large, 6-13 mm long and 7 mm broad, woolly, 3-10 mm apart. Radial spines: 10-20, 1,5-2,5 cm long, stright, spreading, dark grey to tan. Central spines: 3 to 6, stronger, up to 4 cm long, straight or recurved and spreading, almost black, becoming grey with age. Flower: Pretty small up to about 2,5 cm long, bi-coloured with magenta, rose to the violet petal tips and pinkish-white, white or yellowish-white throat. Blooming season: Blooms late summer. Fruits: Barrel shaped, 1,5-2 cm long, 1 cm in diameter, red or reddish-green partly hollow at maturity, only scarcely woolly, apical areoles not spinescent. 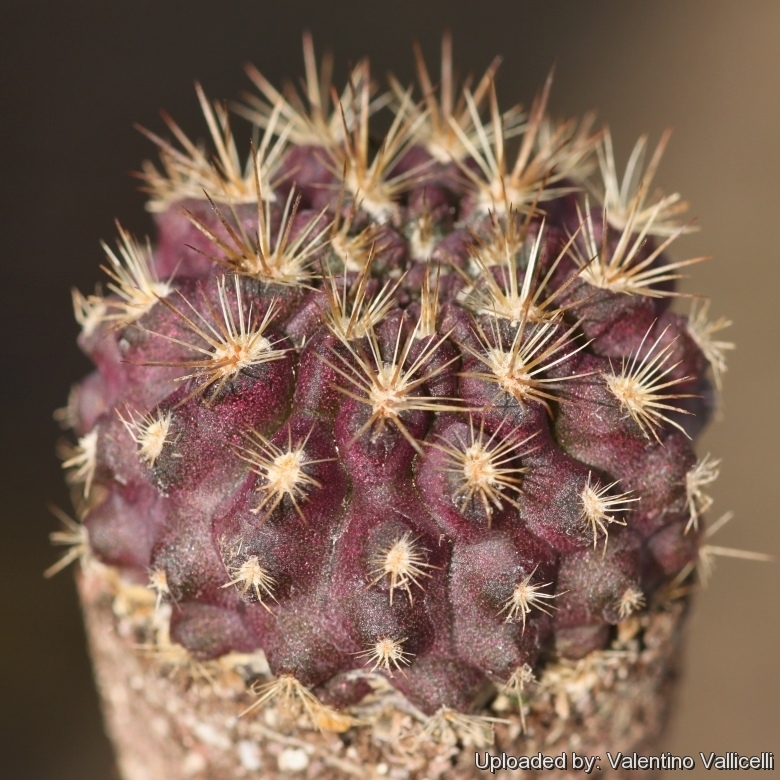 Cultivation and Propagation: Eriosyce subgibbosa f. rapifera|SN|13748]] is a summer-growing species of relatively easy cultivation that continues to be, a particular prize among collectors. This plant is extremely xerophytic, adapted to very dry soils and is quite susceptible to over-watering if kept in a non ventilated place.